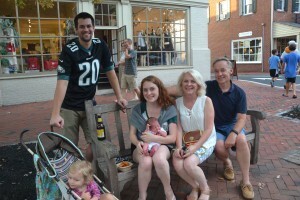 The sidewalks of downtown Haddonfield were filled with people last Thursday, hoping to get a bite of the action and food that was available for tasting at the first Haddonfield Night Market. The Haddonfield Night Market seemed a success, as lines for food were extensive, visitors were smiling and laughing as they sampled the food trucks’ offerings and businesses participated in the fun. Attendees had the chance to taste the fare of eight food trucks, but as to what was the best, the answers were mixed. 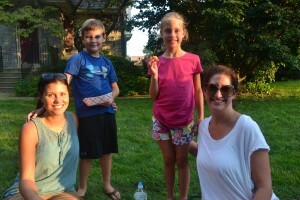 Haddonfield’s Dan Riley, a cooking teacher, and Grace McAleer said they were waiting for the Haddonfield Night Market for weeks, as they were excited to sample the foods. They tried the cuisine from Cow and the Curd, Rio Brazilian Steak Truck and My Four Suns. Riley said all of the food was good, but his favorite was My Four Suns, and McAleer agreed. “(The Korean rice bowl) was definitely the best,” Riley said. The Sylvester family of Audubon, hearing about the event through Facebook, love the Haddonfield area and thought it would be a fun Thursday night to sample foods. They had foods from Mama’s Meatballs, Tot Cart and My Four Suns. 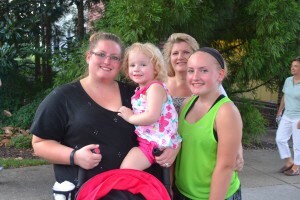 Nicole Sylvester said her favorite was Mama’s Meatballs while her daughter Natalie’s favorite was from the Tot Cart, having bacon and cheese tots. Carrie Ellinwood said she couldn’t decide. “They were all so good,” Ellinwood said. Other attendees had just started making their way through the food trucks at the Night Market, but liked what they had and were excited to try more. Haddonfield’s Erica and Olivia Grant and Danelle and Daniel Riso began their journey at Say Cheese, having a variety of cheese related items to munch on. Both Erica and Danelle were looking forward trying the different food trucks, but were secretly hoping for one that served dessert. Their children wanted to try the cheese curds. 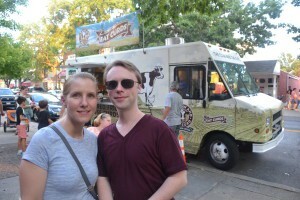 Matt and Michelle Jackson of Swedesboro love food truck events, so they couldn’t wait to try a bit from each truck. They stopped at Mama’s Meatballs and ordered curds from the Cow and the Curd. The Jacksons said they like the area and events like this are great foot traffic for the shops. The Eiferts of Maple Shade and McKenneys of Marlton decided to have a family outing and enjoy the nice weather, while having some tasty bites to eat. They started their journey off at Mama’s Meatballs and were waiting for their cheese curds to cool before they sampled those. Tierney Eifert was looking forward to trying the foods of the Beast of the Street and P.J. Whelihan’s Wing Truck. Not only was there food available to attendees by food truck, but also the restaurants of Haddonfield were open to visitors as well. To entertain the crowds there was music provided by DJ Frank Staff at Haddy and Corner Pocket in the Kings Court gazebo. The downtown Haddonfield stores also had some outdoor demonstrations, such as painting and food displays; to keep patrons and shoppers entertained while they dine. All of the attendees were surprised by the number of people that came out to the Night Market. They all agreed this was a great event and perfect to have in Haddonfield, as it is such a walkable area. They suggested the town do it again, however, for the future, the food truck locations should be shut down to traffic. “I think this is great. It is such a large turnout. Maybe next year, they could consider blocking off the road and expanding it,” Erica said.